Making sure you capture the right sound correctly throughout your filmmaking is one of the most important aspects of the shooting process, an element that many seem to get wrong time and time again. Whether you're filming an interview, documentary or short film, the audio recording is an intrinsic part of a good quality production. Here's how you can make sure you manage great audio monitoring and avoid making the most popular mistakes. Filmmakers will spend hours on end focusing on actors, set design and lighting whilst commonly sidelining the audio, which needs to be just as perfect. There is simply nothing more disappointing than finding yourself being left with a first rate shot with second rate audio. Filming without monitoring can often lead to serious audio failures. Depending on the environment you are shooting in, you need to be aware of minor sounds that could lead to bigger problems that will ruin your footage later on in the edit process. For example if you are filming an interview in a busy coffee shop the sound may seem fine to you, but on the playback you may notice interference from ambient sounds such as customers, air conditioning and a whole host of other audio nasties. Having a good pair of headphones is vital to any audio monitoring, so many make the mistake of removing headphones whilst filming which makes them unaware of major audio issues which would not have occurred if they had simply had just left them on. Relying on audio meters 24/7 is not going to do you any favours, therefore grabbing yourself a good pair of either closed back headphones or noise cancelling headphones is an absolute must. So what headphones should I use? Closed back headphones come at various costs but if you are wanting to save a few pennies then going for a pair like the AKG 44 on www.gak.co.uk would be ideal. 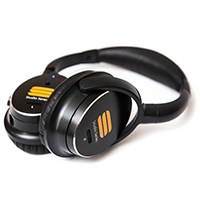 Otherwise investing in a good set of noise cancelling headphones like the StudioSeries ANX 10 available at bitly.com/anx10 would ensure that you would be blocking out nuisance noises such as traffic, making sure you have 100% focus on your audio monitoring leading to better video productions. Noise cancellation headphones add an extra layer of monitoring enhancements as they actively block out the noise directly around your ears. This means when you monitor audio whilst using noise cancellation headphones, you can guarantee you're only hearing the sound coming from the microphones, you'll be able to hear a pin drop! What if your camera does not have a built in headphone jack? Purchasing an external recorder would be beneficial so that your recordings are a high quality throughout your filming process. Spending more time on monitoring always enhances your film productions. Do you have any tips on audio monitoring? If so tweet us at @editorskeys and we will share the best tips!